When our sled dog Mug was just a pup, he and his brother were best friends! When they were born, Mama Husky nibbled Mug’s left ear which made it lay down flat, and nibbled his brother’s left ear which made it flop forward, so that’s how you could tell them apart! Unfortunately they were separated a few months after they were born. Missing his brother, Mug howled every day in hopes that he would find him and be reunited. One day in 2015, when Dutch Springs staff was clearing out a path for the Map and Compass program, they discovered very large animal paw tracks. 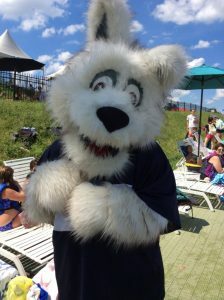 Shortly after, there were sightings of a large, white, dog-like creature playing in the Aqua Park after hours. Dutch Springs staff investigated but the figure was so quick, they could never catch it. One day as the Dutch Springs sled dogs were preparing for a presentation, they were joined by a large, white husky – Mug’s long lost brother! 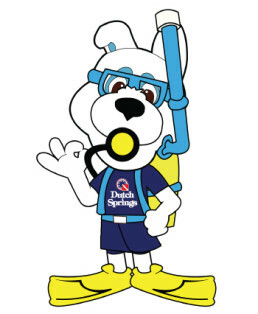 He told the staff he loves scuba diving and playing in the Aqua Park at Dutch Springs, so they did the only thing they could think of – hire him to be the Official Dutch Springs Ambassador of FUN! 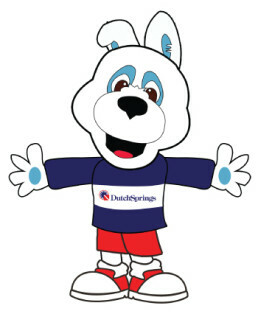 With Dutch Springs’ friends help, the new Ambassador of FUN received his name – SPLASH! Download your own Flat Splash! Splash has such a great time with everyone out in the community that he wishes he could be with everyone — and now he can! Whether on land, in the sea, or in the sky – he wants to go with you! Click below to download your own Flat Splash, print him out, and take him with you on your adventures! Make sure you snap a picture of your Flat Splash and post it to social media with #DutchSprings and #FlatSplash Don’t have social media? No problem! 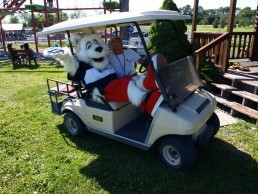 Send it to fun@dutchsprings.com and we’ll share it for you! Click Below to Download Your Own Flat Splash! Choose between two different outfits –or print both – and let the adventures begin!